Growing up in a dull Los Angeles suburb well before the era of hipster food trucks, street food wasn’t much of a thing, especially since you rarely left the car to, you know, use your feet. Aside from the blissfully thirst-quenching Mexican paletas (popsicles) made from real watermelon or strawberry that I bought as a kid from vendors pushing white carts along the scorching sidewalks, noshing on something delicious while ambling around simply wasn’t a ritual in my home town. 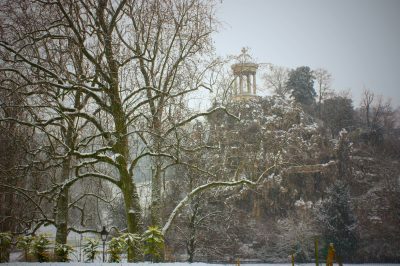 So when I first moved to Paris, I was surprised at how frequently I observed people huddled around street corners, casually ambling or perched on park benches– and gobbling down anything from crepes and bakery sandwiches to falafel and Vietnamese spring rolls. 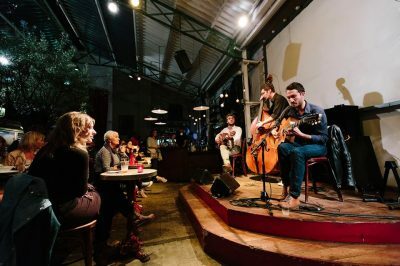 It’s not just the tourists, either: despite the decidedly French– and often vocal– disdain for “le snacking” (eating outside of “normal” meal times), Parisians are increasingly gaga about street food. 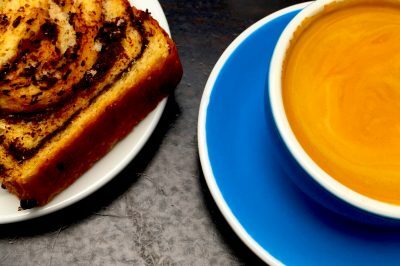 It’s starting to become recognized as a culinary category in its own right, where in the past it was generally viewed as something that unfortunate office workers with too-short lunch breaks had to endure, deprived of a proper meal and forced to eat sur la pouce (literally, ” on the thumb”– in a rush). Without further ado, here are my favorite spots for a cheap and casual bite– perfect alternatives to avoid spending a fortune on a sit-down meal. They also make great quick meals when you’re roaming the city and can’t be bothered to take the time for a more formal lunch or dinner– or for easy, spontaneous picnics. I haven’t included any sweet options here– stay tuned for a separate feature on desserts, pastries and gelato on the go. 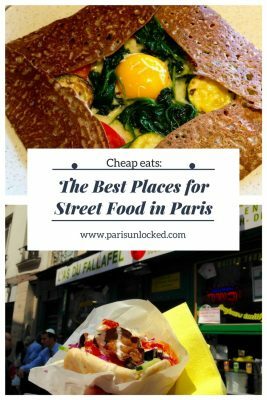 This is one street food ritual in Paris that’s been running strong for years, well before “foodie” culture took hold– and it happens to remain my tried and true. 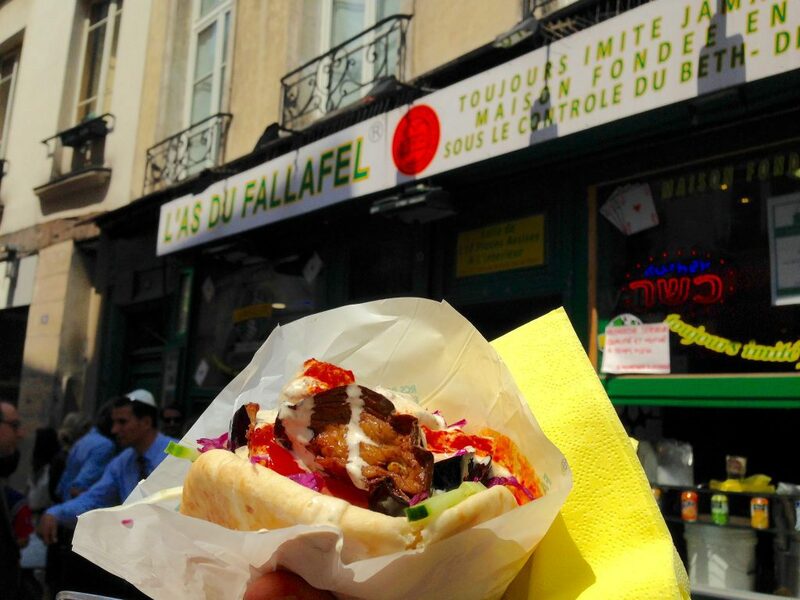 Of course, I’m not at all original in my steady love for the remarkably delicious, distinctive falafel served at a string of restaurants on Rue des Rosiers, in the heart of the old pletzl (Jewish Quarter). The Israeli-style pita sandwiches served at L’As du Fallafel ( 34, rue des Rosiers; Metro St-Paul) manage to combine a pleasing crunch (from cucumbers, deep-fried chickpea balls and chopped purple cabbage) with a soft, warm, oily goodness (think thick pita, melting slices of fried eggplant, and a slathering of creamy tahini dressing). The combined effect is purely addictive, even if handling the overflowing pita often results in unsavory accidents and dribblings of tahini down your coat. You can read my full review of L’As here, and peruse reviews by fellow travelers over at TripAdvisor. Other falafel joints on Rue des Rosiers are almost just as good– I especially love Chez H’Annah (at number 54). When I’m craving more raw vegetables and less greasy sauce, I beeline there, as their sandwiches are chock full of shredded carrots and cabbage, and somehow seem a bit healthier. The lines are generally shorter here than at L’As, too. Chez Marianne, meanwhile, (2 Rue des Hospitalières Saint-Gervais, at the corner of Rue des Rosiers) is best for eating in: I find their take-out pitas degrees less delicious and satisfying than the ones served elsewhere on the street. 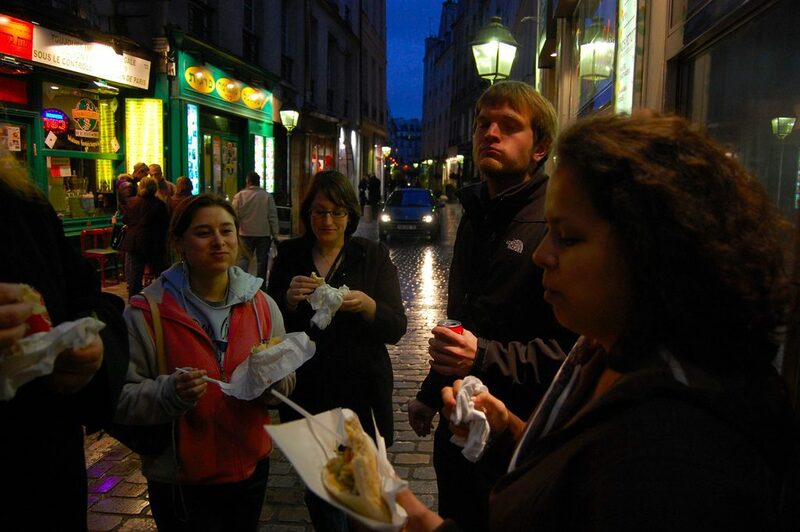 Try this coveted sandwich as part of a guided adventure: Get 5% off a food tour of the Marais with The Paris Guy. Simply enter the promocode “PARISUNLOCKED” when you check out to secure your discount). The ritual: There’s no hard and fast rule for how to eat your falafel. I generally try to delicately eat some of the fillings with the aid of a fork before consuming the rest like a traditional sandwich, thus avoiding the aforementioned spillages. 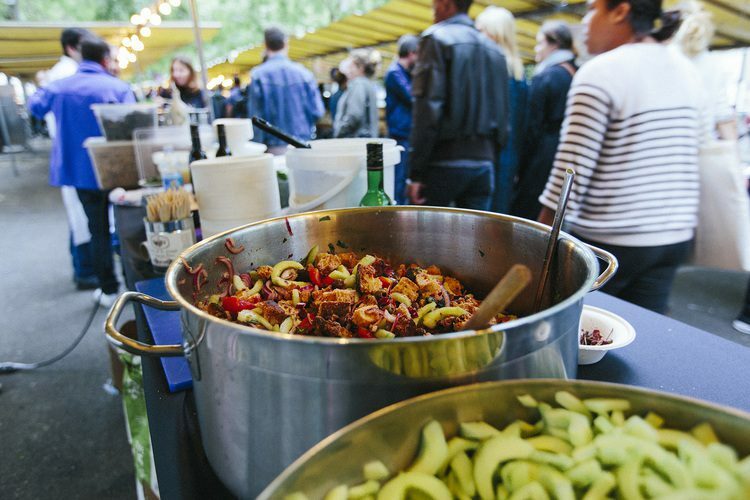 You can either eat right outside the restaurant, or carefully transport your goods to a nearby park or square (Place des Vosges is a great place for a casual picnic). Coming in a close second to falafel from Rue des Rosiers are fresh Lebanese pizzas from Man’Ouché, a small stand situated in the city center, a block away from the Centre Georges Pompidou. 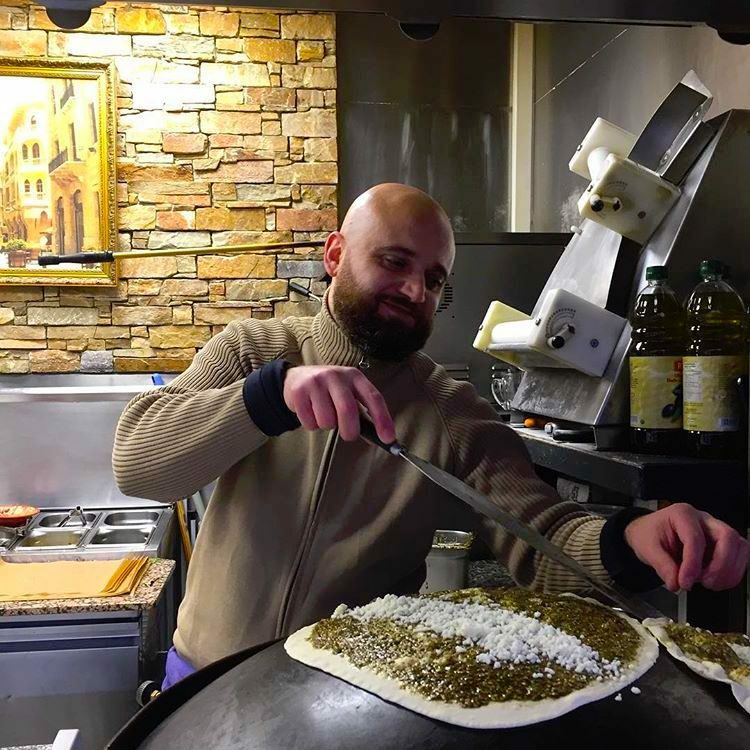 Made by hand on a hot, dome-shaped griddle, these large flatbreads are meal-sized versions of the smaller ones served in most Lebanese eateries. Traditionally smothered with a layer of za’atar, a distinctively aromatic seasoning made by crushing sesame seeds, sumac, thyme and other herbs and blending with olive oil, other common toppings include Lebanese cheese, fresh mint leaves, black olives and shredded meat. The handmade, doughy flatbread is rolled into a wrap with your desired ingredients and then encased in foil to keep it warm and melty– perfect for strolling around and nibbling, or settling to sit (as per my own tradition) on the enormous, sloping plaza overlooking the Pompidou. Just watch out for the pigeons– they love the stuff too, and certainly aren’t shy about trying to steal your food. 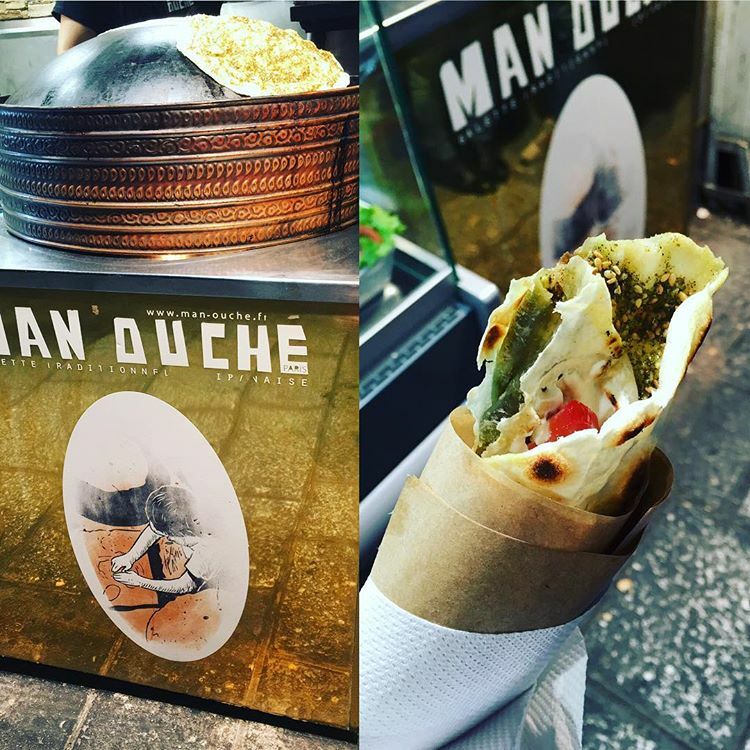 Man’ouché also sells falafel wraps, kebab and a variety of other Lebanese specialties for takeaway. Paris has multitudes of crepe stands and restaurants, but not all are good: lower-quality vendors prepare a heaping pile of crepes in advance, then reheat them, making for a gummy and less-than-fresh tasting pancake. When looking for crepes (sweet pancakes filled with jam, nutella, sugar, lemon or other dessert fillings) or galettes (Breton-style pancakes made from a nutty, hearty buckwheat flour and topped with savory ingredients such as cheese and egg), make sure you choose vendors who pour the batter onto the crepe pan right in front of you; also verify that the ingredients look reasonably fresh. 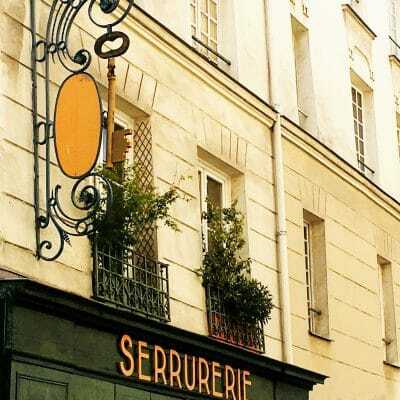 My favorite creperies in Paris offering take-out crepes and galettes include Breizh Cafe ( 111, rue Vieille du Temple, Metro Hotel de Ville), long-renowned by foodies and now adored by locals as well. While it can be very difficult to get a table at the sit-down restaurant, especially on weekends, the adjoining epicerie/grocery mercifully sells them to go. 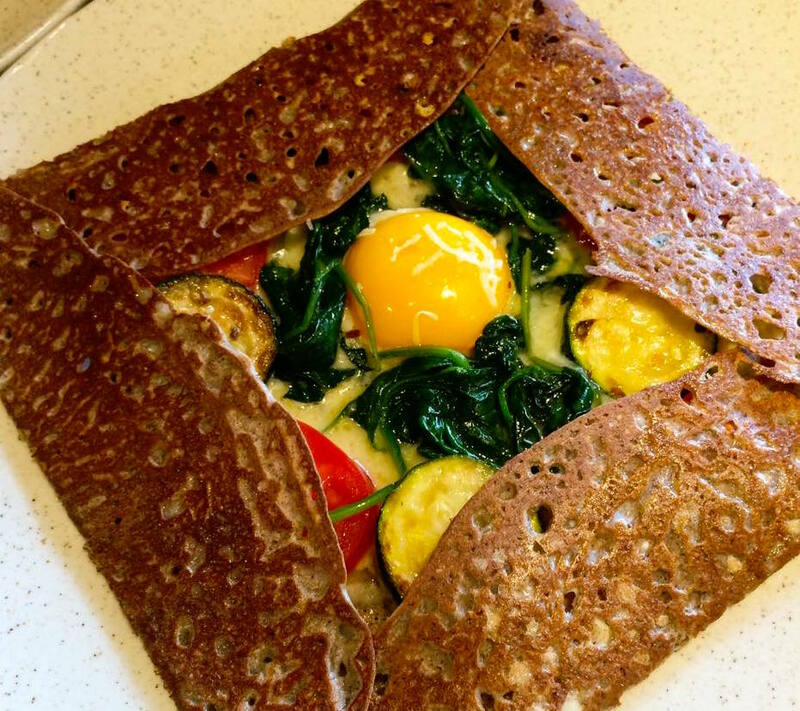 With their focus on fresh regional ingredients and delicious, inventive fillings (their “Bretonne” savoury galette is a favorite, combining mushrooms, cheese, poached egg, smoked ham, creme fraiche and Basque Espelette pepper), Breizh has never disappointed me, despite being rather picky about crepes. As a (mostly) vegetarian, my favorite savory galette there features sliced and grilled zucchini, egg, tomato, cheese and spinach. For dessert, their apple and salted butter caramel crepe is equally divine. 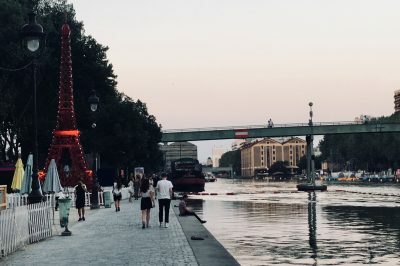 Heading across the Seine to the left bank, another takeaway stand I like is L’Avant-Comptoir in the Latin Quarter/St-Germain district (3, carrefour de l’odeon, Metro: Odeon). This is a no-nonsense but consistently good option for a crepe or galette before or following a night of drinks in the Quartier Latin, or a show at a nearby theatre. This recently conceived pop-up market in my beloved long-time neighborhood of Belleville runs two times a month, and sees 20 food vendors set up shop to serve everything from tacos and gourmet burgers to Vietnamese Pho and Moroccan tajines, as well as French specialties like moules-frites. Main dishes will set you back less than 10 Euros each, and if you’re lucky you’ll snag a seat and one of the large tables, making for a convivial (and remarkably cheap) evening out. When: Every second Thursday of the month, from 8:00 to 10:30 pm. See this page for forthcoming dates. While the places and goodies covered here are my long-time favorites, plenty of trendy new food trucks and creative little eateries are offering decent to excellent street food these days in the capital. For even more suggestions, I recommend this page at Time Out Paris. And make sure to check back here soon for more suggestions on where to dine out, picnic and nibble in the capital. There are some great food tours you can book here (via TripAdvisor). 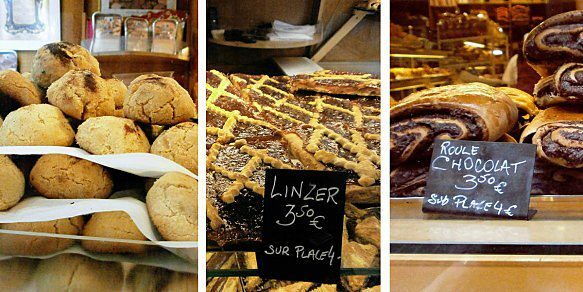 I also highly recommend the food tours of Paris offered by Eating Europe: they’re authentic, culturally enriching and give you plenty of goodies to sample, including some excellent street and bakery fare. Special offer: Book a Paris tour at Eating Europe and get 10% off the listed tour price when you enter the promocode PARISUNLOCKED at checkout. Glad you enjoyed the article! I have been a fan of L’as since moving to Paris many years ago, but also think others on the street make delicious food too. Chez Marianne is definitely the nicest place for eating in, I’d say, followed by Chez H’annah.